After spending about N6.215billion already in eight years on the new official residence of the nation’s Vice President in Abuja, the project remains enmeshed in controversy. While the House of Representatives Committee on FCT is alleging that the job done does not commensurate with the 87 percent of the contract sum paid, no one seems to know when the project will be ready for occupation. The project has been abandoned in the last five years owing to disagreement between the Senate and the Federal Capital Development Authority on the variation of the project. The contract was awarded in 2009 at a cost of N7billion but N6.215 billion was paid to the contractors. n 2012, the immediate past Minister of the FCT, Senator Bala Mohammed, submitted a request for additional N9billion to complete the project. The complex is made up of the followings: VP’s ADC’s house (N258m); Chief Security Officer’s house (N228m); mosque (N95m); Church (N84m); security quarters, (N114 m); boys quarters( N288m); Gate House(N55m); infrastructure (N1.7 billion), among others. 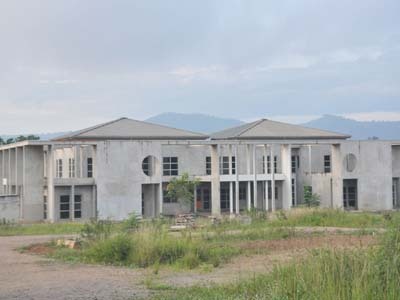 While the government was trying to find solution to the contract stalemate, a fresh row is trailing the new residence. The Chairman of the House Committee on FCT, Hon. Herman Hembe, who spoke with one of our correspondents yesterday, said his committee was disappointed at the way the contract was being managed. Hembe said: “In all, about 87 percent of the contract sum has been paid. You can go and take a look and say by yourself if the work done is commensurate with the funds so far paid. A top source said: “We are suspecting underhand dealings by some key officials in the past administration of ex-President Goodluck Jonathan. “Initially, a variation of N13billion was proposed but public outcry forced them to reduce it to N9billion before the BPP scaled it down to N6billion. “Also, the job done is about 50 percent but 87 percent payment of the contract sum was effected. “As I am talking to you, nobody knows the timeframe for the completion of the project. And when the 87 percent payment was done, the agreement included furnishing materials. But we learnt the contract scope has been altered. Another source said: “There is a dilemma on what to do because the residence is not a priority project for this administration. The nation cannot afford to spend as much as additional N6billion on the new residence. “Again, the government cannot abandon the project after attaining about 50 percent completion. But the resources are not just there now. The only option is the completion of the project in phases. Responding to a question, the source added: “The nation has about 19,000 projects abandoned in the last 42 to 43 years. We may need about N12trillion to complete these projects, including the new residence of the Vice President. All calls and text messages sent to the Special Assistant to the FCT Minister on Media, Sani Abubakar, and Chief Press Secretary, Muhammad Sule, were not acknowledged.